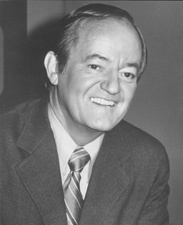 Hubert Horatio Humphrey, Jr. (May 27, 1911 – January 13, 1978) was an American politician. 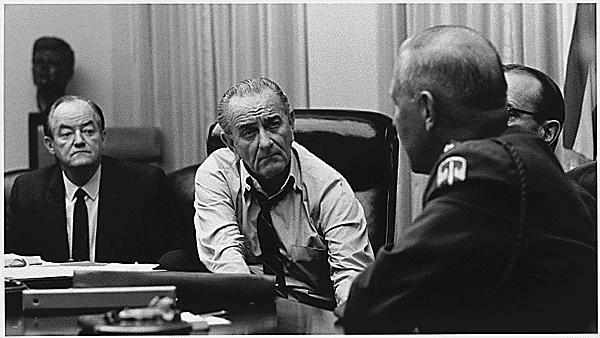 He was the thirty-eighth Vice President of the United States from 1965 to 1969, under Lyndon B. Johnson. Humphrey was born in a room over his father's drugstore in Wallace, South Dakota. He was the son of Ragnild Kristine Sannes (1883–1973), a Norwegian immigrant, and Hubert Humphrey, Sr. (1882–1949). Humphrey spent most of his childhood in Doland, South Dakota, on the Dakota prairie; the town's population was about 600 people when he lived there. His father was a licensed pharmacist who served as mayor and a town council member. In the late 1920s a severe economic decline hit Doland; both of the town's banks closed and Humphrey's father fought to keep his drugstore business open. 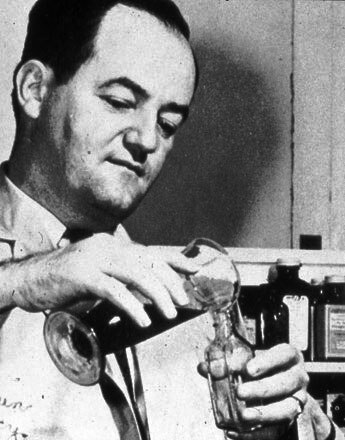 After his son graduated from Doland's high school, Hubert Humphrey, Sr. left Doland and opened a new drugstore in the larger town of Huron, South Dakota; a population of 11,000 people, where he hoped to improve his fortunes. Because of the family's financial struggles, Humphrey had to leave the University of Minnesota after just one year. He earned a pharmacist's license from the Capitol College of Pharmacy in Denver, Colorado (completing a two-year licensure program in just six months), and spent years from 1931 to 1937 helping his father run the family drugstore. Over time the Humphrey Drug Company became a financial gain business and the family again succeded. Humphrey did not enjoy working as a pharmacist, and his dream was to earn a doctorate in political science and become a college professor. In 1937 he returned to the University of Minnesota and earned a bachelor's degree in 1939. He was a member of Phi Delta Chi Fraternity. He also earned a master's degree from Louisiana State University in 1940, serving as an assistant instructor of political science. One of his classmates was Russell B. Long, who would become a U.S. Senator from Louisiana. He then became an instructor and doctoral student at the University of Minnesota from 1940 to 1941 (joining the American Federation of Teachers), and was a supervisor for the Works Progress Administration (WPA). Humphrey soon became active in Minneapolis politics, and as a result he never finished his PhD. 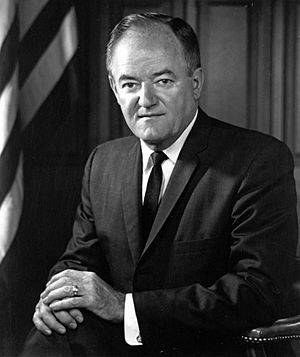 Humphrey twice served as a United States Senator from Minnesota, and served as Democratic Majority Whip. He was a founder of the Minnesota Democratic-Farmer-Labor Party and Americans for Democratic Action. He also served as mayor of Minneapolis, Minnesota, 1945–1949. In 1968, Humphrey was the nominee of the Democratic Party in the United States presidential election but narrowly lost to the Republican nominee, Richard Nixon. Humphrey working as a pharmacist in his father's pharmacy. 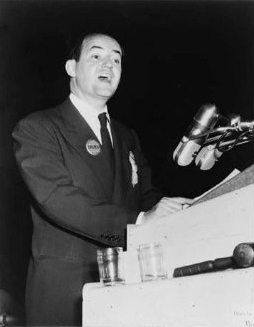 Humphrey at the 1948 Democratic National Convention in Philadelphia. Humphrey alongside Coretta Scott King and Civil Rights Leader Dr. Martin Luther King Jr. Senator Hubert Humphrey with Democratic presidential nominee Jimmy Carter, in 1976. California Governor Jerry Brown is at right. Hubert Humphrey Facts for Kids. Kiddle Encyclopedia.